Food is a powerful thing, isn’t it? Sometimes it’s a particular smell that can jolt our memory and transport us back to a great aunt’s kitchen on a warm summer day, and sometimes it’s taste. These cookies hit me with no warning. As soon as I took a bite I was immediately 18 again. I was a freshman in college, and although I chose a school right in Pittsburgh and could have easily commuted, I chose to live on campus. I was settled in, and while my Dad had to drive through the city to get to his job every day, he promised that there would be no surprise pop-in visits to my dorm room. That being said, we still scheduled a fair share of visits, usually once every week or 10 days. We would hop down to one of the eateries on campus (typically Burger King or Subway) for dinner, and he usually brought me some type of edible treat from my mom. 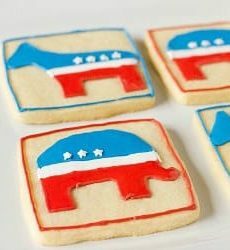 At the time I was going through a huge love affair with sugar cookies from the grocery store bakery. One specific visit stands out to me. It was probably early November, a grey and dreary day (shocking for Pittsburgh, I know) and he brought me a box of sugar cookies. I savored them for days. I wish I could have had many more little impromptu dinner dates with my dad while I was in college as he was passing through town on his way home from work. Unfortunately, he passed away that spring, and these cookies definitely tugged at my heart strings this week. To make what turned into a very long story short, these cookies taste exactly like the ones that he brought me from the grocery store, that I loved so much at that time. 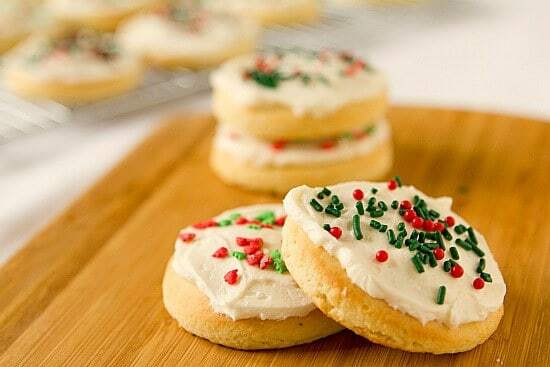 I know I make a lot of sugar cookies and I already have a ton of recipes here on the site, but I couldn’t resist trying these when I saw them described as tasting exactly like the ones sold at grocery store bakeries. I was in… hook, line and sinker. What I didn’t know, however, is that this is actually an old family recipe that was passed down from generations and when the Lofthouse folks first began selling them, it was from the back of a pickup truck. Now they deliver their cookies all over the country. I love stories like that! These cookies are soft and moist, and a bit fluffier than the ones I usually make for decorating. They have that characteristic flavor of the bakery sugar cookies, which I think is due in part to the inclusion of sour cream in the batter. That also helps to keep them nice and moist. The buttercream frosting is incredibly easy to make, very light and also fluffy. Since my kitchen is well into holiday mode at this point, I went with plain white frosting and some Christmas sprinkles, but you could add a drop or two of food coloring to the frosting to make it whatever color you’d like, and decorate however you wish. The possibilities are endless! Stored in an airtight container, these stay nice and soft, and I think they taste even better after sitting in there for a day or so. 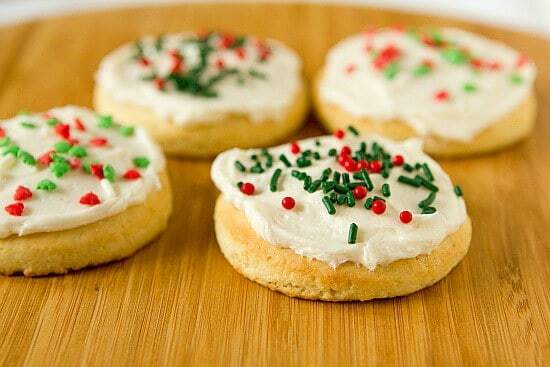 This is a fabulous, easy sugar cookie and frosting recipe for the holidays if you don’t have the time to tackle the traditional cut-outs with royal icing decorations. Enjoy! 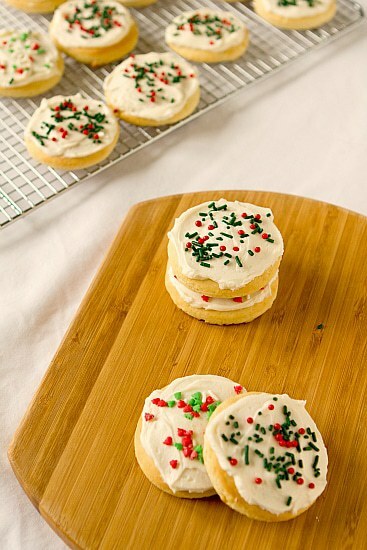 A recipe for the famous Lofthouse brand sugar cookies found in the supermarket bakery section. To make the frosting, in the bowl of a stand mixer fitted with the paddle attachment, cream together the butter and vanilla. Slowly beat in the powdered sugar and the pinch of salt. Once smooth and creamy, add in heavy cream, 1 tablespoon at a time, then beat at medium-high speed for a minute or two until light and fluffy. If desired, add food coloring and beat until combined. Am I able to substitute Cake Flour for the All Purpose Flour? Hi Brenda, Doing so would alter the texture of the cookies. Can I freeze the dough?! Hi Tricia, Yes, I’m able to stack these once dry with a layer of parchment between without an issue! If I make the dough this weekend to cook next weekend….would you refrigerate it first overnight and then freeze or put in the freezer right after preparing the dough? Should I take the dough out the night before I plan to cook? Thank you! Hi Carolyn, I would put it in the freezer right away and yes, put it in the refrigerator to thaw the night before. You are the best…thank you! Any good baked or crockpot ham recipes? 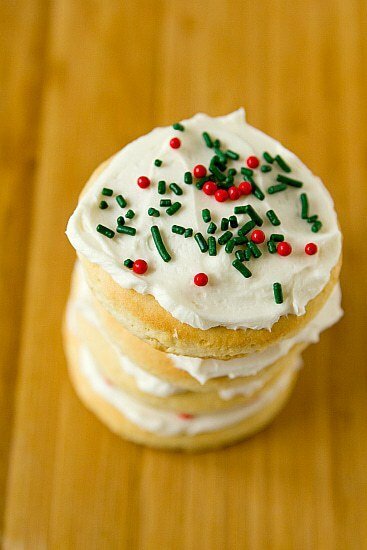 We have a birthday boy that likes plain sugar cookies…thoughts on this recipe and just leaving off the frosting???? Any changes? Thank you! Hi! My daughter is making these for a friend and decided on the soft and chewy version! Thank you for the suggestion! Made these this morning and they are wonderful.!!!!!!!!!!!!!! Hi Michelle, I noted in the recipe that it yields 5 to 6 dozen cookies, so it’s possible that you made yours smaller and thus got more cookies out of it? If i wanted to make this into one giant cookie cake, what do you suggest the bake time would be? My daughter does not like cake or cupcakes, but LOVES the sugar cookies from the store. Her best friend has a peanut allergy so we just make everything from scratch to avoid any peanut issues. Thank You!! Hi Kasi, I haven’t tried that with this particular recipe, so I’m not sure exactly how long you would need to bake it. I’d probably start checking around 20 minutes, just to make sure you don’t over bake it. Enjoy! The dough came together beautifully, didn’t have any problems rolling it out at all (seriously, these are the easiest-to-roll sugar cookies I’ve ever made). They puffed up nice and soft in the oven. Have yet to frost and taste them! I’ll let you know how they turn out. I liked these cookies. But they came out to biscuity, I was hoping for a more soft and cakey cookie. The dough was very sticky as well even after chilling overnight, so I might have had to use a lot more flour just to roll them out. But overall a fairly good cookie recipe. Thank you for posting this. Holy smokes…These are awesome. My “food-critic” teenager said are better than the store bought version. Made the recipe exactly as posted. How can these be store in an air tight container, but not refrigerated, if they have buttercream frosting? I typically do not refrigerate things with buttercream icing. It is still enough that it doesn’t melt or anything like that at room temperature. I made these for Memorial Day yesterday and oh my gosh, they were a huge hit! I had some leftovers so I sent them with my kindergartener to school today. I am sure they will be loved there as well. Another great recipe from Brown Eyed Baker, thank you! Sending hugs Kaitlin! I too lost my father last month to cancer and your sharing really hit home for me. I made these cookies and really liked them. They were REALLY good the third day after being stored in an airtight container. The cookies became softer each day. BTW – I used 1/2 all purpose flour and 1/2 cake flour because I love Softasilk flour! After all the comments about the consistency of the dough, I decided to treat these as slice and bake cookies. I didn’t have the patience to deal with contrary dough. It worked perfectly! Simply create your desired size roll, store in freezer, slice 1/4 inch thick and bake. Hi BrownEyedBaker! 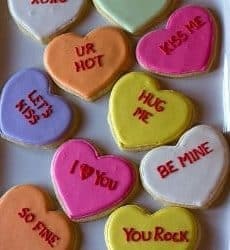 I want to have these cookies for Valentine’s Day but, I’m scared that these cookies will taste like flour when I roll the cookies out. I’ve tried to make rolled cookies before but, they were a complete disaster. Can you give me some tips about rolling cookie dough or tips about this recipe? Hi Mary, They won’t taste like flour! There are a couple of things you can do if you’re nervous, though. Use a pastry brush to brush off any excess flour once you’re done rolling out. You could also try to roll the dough between pieces of parchment paper instead of using flour, which sometimes works. Thank you Michelle! When I made them I rolled them into balls and flattened them with a floured, wooden spatula. It worked great and they were absolutely delicious! Thanks for the great recipe…the sour cream is what I had been missing in other recipes I tried! 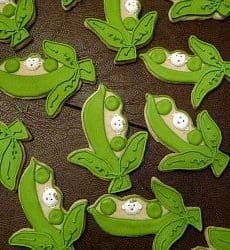 Do you think these can be made as a drop cookie or does the dough absolutely need to be rolled out? These look super yummy! Hi Lindsey, I haven’t made these as drop cookies, so I can’t give you a firm answer, but I think if you rolled them into balls, then flattened down to a 1/4-inch thickeness with the palm of your hand of the bottom of a glass, that it could work. I made these for Christmas and enjoyed using colorful sprinkles on top. Big hit with the grandkids! One comment is that my dough was super sticky, almost glue like. Freezing the dough didn’t help much either. I’ve made many (!) recipes posted here and this is my first “fail.” Good flavor but very hard dough to work with. I’ll stick with sugar and Spritz cookies. 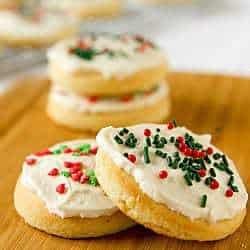 These were good, but I still prefer and LOVE your original, first sugar cookie and icing recipe. Those were deliciously dreamy!